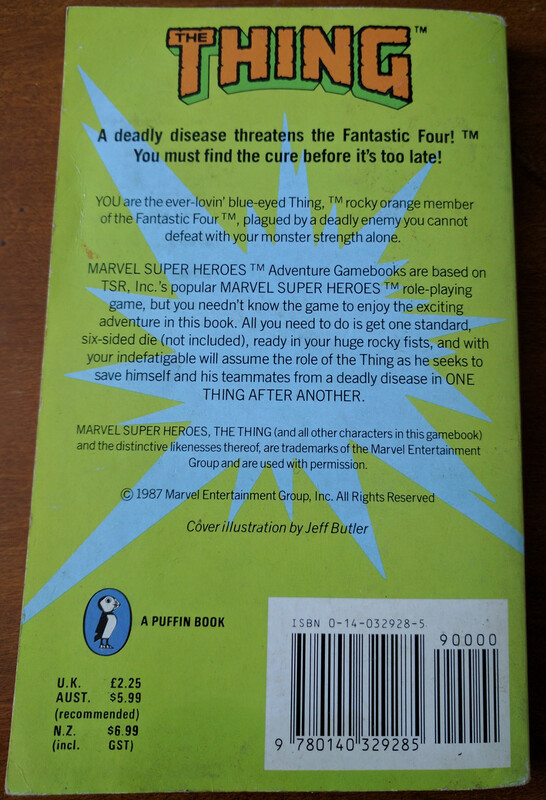 One Thing After Another was published by Puffin in 1987 and based on the TSR Marvel Super Heroes role-playing game. It’s a game book in the regular format with the reader/player flicking between numbered sections as they make decisions throughout. The role-playing elements are very simplistic with the player stats all predetermined and combat simply being a case of rolling one die to decide the outcome. There is the notion of “Karma” points which can be spent at any time to increase the value of a die roll. Learning where to spend these should more of less guarantee victory but a little luck never hurts either. 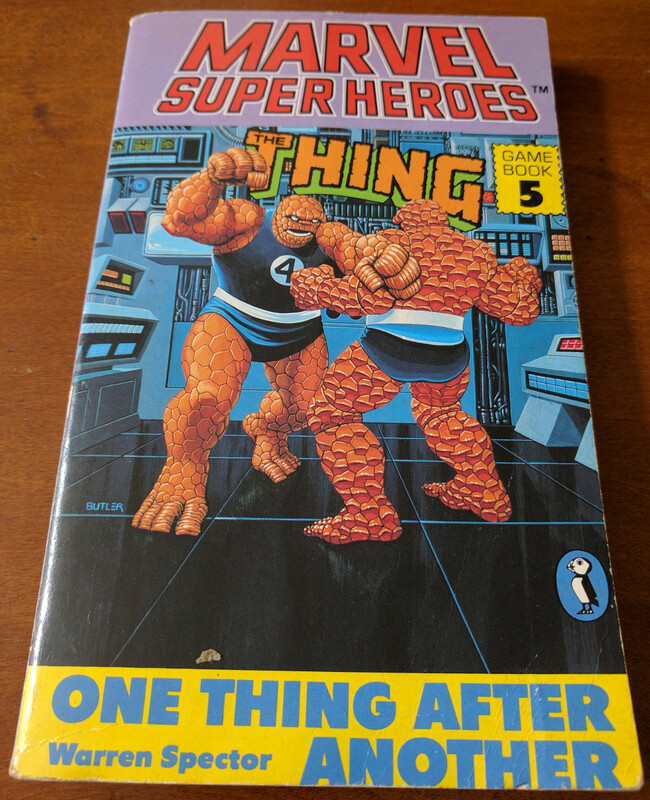 In this tale, the player takes the role of The Thing from the Fantastic Four. Early on, the gang are all infected by a super hero targeting virus with only the Thing being strong enough to venture out to seek a cure. It’s tricky to describe the plot from here on out as there are numerous paths through the game with no single correct route. The main thread however involves collecting blood samples from Things in alternate dimensions in order to use them in making a cure for the disease. These alternate dimensions feature the familiar cast of Marvel heroes and villains but life has taken a very different turn for all of them. For instance Dr. Doom is on the right side of the law in the first dimension and the Thing is now King Kong sized and indeed climbing the outside of skyscrapers while terrorising the city. This doesn’t make it easy to get a blood sample off him and this was the section that needed several attempts to find the correct path. You’ll need to collect a sample in all 3 dimensions to win outright on this path but the alternate dimensions can be avoided all together if the player chooses. I found a way to win by visiting a planet populated by some sort of nano-sized dust creatures who had the ability to enter our heroes bodies and cure them. Having multiple successful endings isn’t something I can remember seeing in a game book before. I’m wondering if this is an early example of his disposition toward offering players multiple paths through each situation that we saw in so many of his later games. I complained somewhat about Spector’s writing style when looking at The Hollow Earth Affair. He uses the exact same style here but being a superhero story it works extremely well and captures the Marvel ethos perfectly, at least in the eyes of someone who has never read a Marvel comic in his life. The book is upbeat, over the top and rattles along at a good pace throughout. It assumes a little more knowledge of the Marvel universe than I possess with some of the characters such as “The Ghost” completely unknown to me. This was never that off-putting – how much do you really need to know about comic book villains anyway? I will say that the experience of playing this is brief. The multiple paths may offer replay value but it really doesn’t take long to get through any one of the routes as a result. Other than that I’d definitely recommend this one, especially since it’s so cheap and readily available. It’s definitely a whole lot more fun than The Hollow Earth Affair. Given that I read every game book I could get my hands on as a kid, I’m surprised that I’ve not come across this series before now. My favourite series at the time was always Joe Dever’s Lone Wolf so while I’m on the subject I’ll strongly recommend the Lone Wolf Saga app on Android which is entirely free and so far has the first dozen entries in the series up and running.